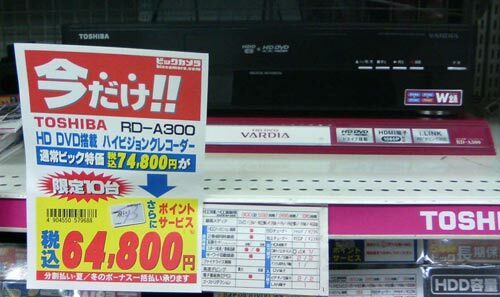 As expected, shops discounted all Toshiba’s next-gen machines first thing this morning – typical prices at stores like the Bic Camera electronics chain saw the Vardia RD-A300 going for ¥64,800 ($610), about $95 down from yesterday. More surprising, however, was what might be construed as a degree of duplicity. The photo of the A300 you can see above was taken in Tokyo this morning and shows a sign explaining that the shop is down to its last ten units at this “Now only! !” price. Now only indeed. Other signs in shops proclaimed that the Toshiba HD DVD drives come hotly recommended – a full hand of five stars from the manager in one case – while HD DVD promotional pamphlets were still available. Onkyo’s HD DVD player was still on sale in spite of the firm also withdrawing from making it. All this without the slightest hint that the machines would be obsolete within weeks. More disturbingly, of the various shop staff we spoke with only one admitted that it would be foolish to buy an HD DVD player now – the rest didn’t even bother to be cagey, even going so far as to claim there would be plenty of HD DVD movies coming out. Given that the companies currently supplying disks – Mitsubishi Chemical and Hitachi Maxell – have already said they’re not sure about continuing media production, Toshiba already faces an uphill struggle.